After brewing pretty much nothing but all-grain beers for the last four years (with a few one gallon experimental extract and partial mash batches sprinkled in), I thought it was time for a full on extract batch. When I first started brewing in college I made two extract with steeping grains recipes before making the leap to all-grain. The first (a brown ale) was pretty tasty, and the second (a vanilla cream ale) was pretty blah. They followed the "classic" homebrew method (partial boil, low pitching rate, poor temp control, lackluster sanitation etc...) so I wanted to see how all the improvements to my general beer making technique/equipment might improve the results of an extract batch. 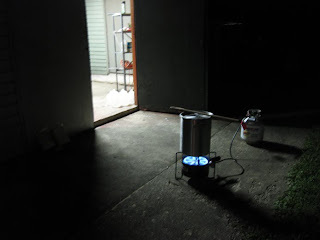 Another reason for brewing with malt extract was to test out my new 210k BTU Banjo Cooker. I wanted to see how it ran without having to worry about mashing/sparging. This was also my first batch at my new house, so I wanted to make sure all the connections worked for my chiller, and everything ran smoothly. This will also be my first kegged batch, so I wanted something that would be ready quickly to test it out. There are a whole range of brewers out there, so if reading tips on extract brewing doesn't really interest you feel free to go back in the archives and read something a bit more Mad (like my Cuvee Tomme clone which I will be rebrewing later this fall), for the rest of you here are my thoughts on brewing with extract. Dealing with water is very different for extract beers is very different than all-grain because when extract is condensed all of the minerals that were in the water used to make it get condensed along with the sugars/proteins. As a result when you add tap/spring water the beer is getting a double dose of minerals. This isn't a big deal, but it is something to think about if your water is hard already or if you are doing any water adjustments. For this batch I used distilled water from the supermarket to reconstitute the extract, this avoids getting the second dose of minerals. I gave the beer a healthy dose of yeast nutrient which is especially important for extract beers because they can be low in things yeast need like free amino nitrogen (due to the storage and processing of the extract). A full boil is important because it reduces the formation of Maillard reaction byproducts (which darken the beer and add flavor). A full boil also improves hop utilization, not too important when brewing a 12 IBU hefeweizen, but critical for any beer that you want to have a good bitterness. iso-alpha acids saturate wort at around 100 IBUs, so if you have 2 gallons of wort at the end of the boil, even if it is saturated with bitterness after you dilute it to 5 gallons at most it will only have 40 IBUs. The fermentation and yeast handling is just as important in extract beers as it is in all-grain. I made a starter with my vial of yeast and didn't pitch it until the temperature of the wort got down to my target fermentation temp of 60 degrees. Pitching warm (as many beginning brewers do) is a bad idea because fermentation will create heat, pushing the temperature even higher which creates excess esters and fusel alcohol. I really enjoyed the batch of hefeweizen I brewed last fall and I had heard that wheat extract (which is a blend of wheat and barley) does a pretty good job without any steeping grains. Amazingly the 2009 Best of Show at the Spirit of Free Beer (my local homebrew club's annual contest) was an extract hefe brewed with an old kit, so it seemed worth a try (with a fresh kit). The recipe for this one was pretty similar to the one I brewed last year. I kept the low starting gravity (1.042) and IBUs (12). The yeast strain I used this time was WLP300 instead of the Wyeast 3068 I used last year, but they are supposed to be from the same source. This grain bill is more wheat heavy due to the fact that the extract is 65/35 and I had gone 50/50 on the all-grain batch. The beer pretty much fermented out at an ambient temp of 58 degrees. I then bumped up the temperature to 64 to ensure that the yeast finish their job, then I will drop the temperature near freezing for about 10 days to help get some of the yeast out of suspension. Finally I'll rack it over to a keg, skipping secondary. Not sure if I will do forced or natural carbonation, but either way I will be aiming for ~3 volumes of CO2. Next up I will be brewing an extract Belgian Single as a warm up for the next beer going into our red wine barrel in a month or so. 0.40 Tsp Yeast Nutrient @15 Min. 0.50 Whirlfloc Tablet @ 15 Min. Took 6 oz of the DME and made a starter with .25 tsp of nutrient and 1.5 qrts of water. Placed into the freezer set to 60 degrees once it cooled. Heated the rest of the 6 gallons of distilled water to a boil on my new burner. Added the DME when the water was ~160, added the hops once all of the DME was dissolved. AA% adjusted down from 2%. Overshot the volume and undershot the gravity slightly despite only using 6 gallons of water total between the starter and the beer. Only able to chill to ~80, Put into the freezer at 60 overnight to chill the rest of the way. 8 hours later pitched the now active starter. Good fermentation after 24 hours. Sometime over the long weekend the krausen pushed off the aluminum foil top, it was in my chest freezer so I am not too worried about infection. 9/8/09 Turned ambient temp up to 64 degrees to help fermentation finish out. 9/13/09 Down to 1.010, fermentation is just about complete. 9/15/09 Put into a fridge to cold condition for a week before I keg it. 9/25/09 Racked to the keg, set to 14 PSI at 45 degrees. 10/14/09 1st tasting, doing well, could use a bit more yeast character. I applaud you for trying extract again. I started similar to you-going whole hog at first. My first batch was extract but I filtered, kegged and bottled using counter pressure. That was 15 years ago. I went on quickly to do all grain, again filtering, kegging-the whole 9 yards. Then I had 3 kids and time became an issue. All grain batches take up an entire work day for me, as with most people. For the last 3-4 years I've made no beer. 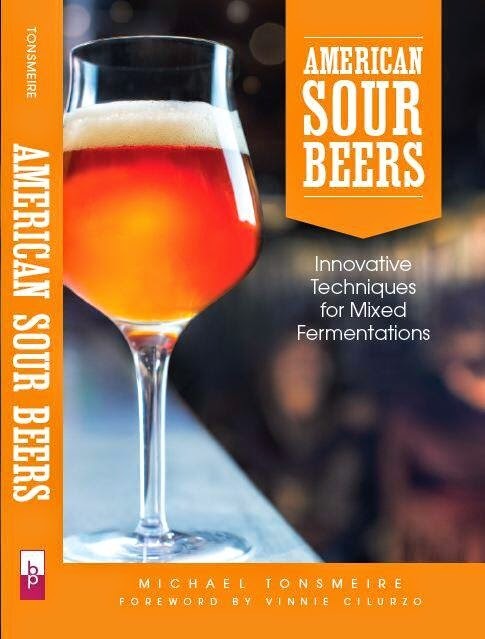 I restarted making extract beers six months ago and have made some killer beers, including an american wheat (accented with dried lemon peel) and a grand cru. I have had multiiple tastings of the grand cru and it's a huge hit. Extract brewing can be done right, but you're left having to use really clean techniques like you mention. I want to try all grain again-but don't want to kill so much time. I'm going to experiment with no/or batch sparging and shorter conversion times, though-along with repitching on earlier yeast cakes-all which should save a good deal of time. You going for more of a clove to neutral flavor profile with the cooler fermentation temps? Also, I would force carb it. Set your regulator to 30 psi for 24 hours then dial it back to around 14-16 psi to get the really good and crisp carbonation for a Hefe. My 1st hefe I carbed at around 12 psi and didn't think it was carbed enough. The lemongrass hefe I did recently I carbed like above and really liked the results. The difference between extract and all grain in my humble opinion is the "grain bite". On beers which don't lean heavily on the grain-husk-taste, the extracts work swimmingly well and they're fool proof. On beers which should have a grain-husk-taste like just about everything in the "amber" category (or like you pointed out - cream ale) then theres trouble. My favorite hopbomb recipe is an extract, however. Having the sharpness of the grains I feel would detract from the malt sweetness competing against the hop bitterness. I disagree on two points - the maltster who is making the extract is going to use RO/Distilled water. Since the extract is only 20% water, you would have serious reactions from the condensed minerals with the malt if you take most of the water out. You would also end up with rocks - sediment - in all your cans from the process. It wouldn't be pretty and your malt wouldn't taste or smell right. While I have no industry experience with making malt syrup, I've never seen anyone make the assertion its any other way then a very controlled process for minerals and PH. The second disagreement is probably personal preference: full boil for the malt extract. I've never had fantastic results with a full boil for malt extract. What I usually do is steep the grains, add the hops, and boil that. Then I warm up the cans or jugs of extract and dump them into the boil. I bring it back up to a boil while stirring to make sure it's all equally sanitized and that's it. When you boil malt extract, I find you lose even more of the volatiles in addition to the risk of scorching or darkening it up. Mengtx, glad you have had some good luck with extract, hopefully these batches go well enough for me to play with it when I don’t have time for an all-grain batch. Scott, I was surprised just how fruity the first batch of Hefe I brewed was when I fermented it in the low 60s, one person described it as fruit salad in a glass. It had a moderate clove flavor, but this one may not have as much as I did a 4 vinyl guaiacol rest on the all-grain batch, something that I doubt the extract maker did. Josh, do you have any sources to corroborate that extract makers use RO/distilled water? In addition to the excess cost of using these, the mash would not be very efficient without calcium (a co-factor for the enzymes involved in conversion), as well as carbonate to buffer the acidic nature of the mash (particularly when making amber/dark extract). I don’t buy that they would sediment out, even a small amount of water can hold onto a huge amount of ions (think about sea water or Burton-on-Trent). "Malt extract is condensed wort and it contains everything that wort contains, including dissolved minerals. Any minerals in your dilution water are added to the (unknown) amount of minerals in the extract. Unless you have a good reason not to, always use soft water (or even distilled water) for extract brewing." Sorry I was talking about whole house water filters in another thread and had a brain fart about what exactly happens. You just bought a house, so you probably noticed that one of the toilets, when left unused, grows stone from the evaporation. And this is just a toilet, losing water as they do. Or, a brew kettle - you've probably noticed the bit of stone left on the side after a long boil. I am sending them an e-mail, I'll CC you. We'll see if we can get some usable numbers. My best guess from seeing the equipment is they keep the water as neutral as possible. So there should be no problem using distilled/RO water when extract brewing. Mike, Welcome to the kegging world! Once you get to the point of wanting to bottle that kegged beer, I'd highly recommend the Beergun. Here's my little write-up of Beergun use. Thanks for the very useful tips. I brewed a batch following them and it turned out great (and had a great turnaround). I didn't keg for real, but I did fill a mini-keg. I didn't record the mash temp, but I did ferment at 62F, and the result was quite nice.